You can trust us when we say that Browser Guardian App is a security tool that does not deserve any of your attention. 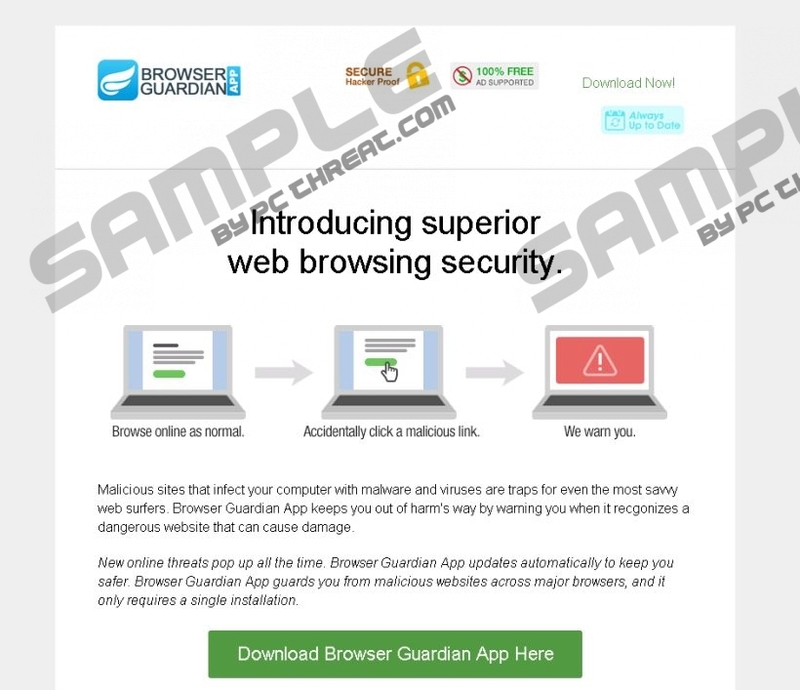 Unfortunately, the information at browserguardianapp.com fools many computer users into thinking that this program can provide “superior web browsing security.” This program should block sites that could be used for infecting computers with malware. The intentions are good, but this program does not have the ability to work in the most beneficial manner, and this is the first reason why you should delete it. Unfortunately, there are far more serious reasons to remove Browser Guardian App. Although it is unlikely that you are aware of Majestic Coupons or CantMissCoupons, we know that these programs are identical to Browser Guardian App. We know this because we have tested these programs in the past, and we have created removal guides to help users eliminate them. All of these programs usually come packaged with third-party programs, and it is impossible to say whether or not they might deserve removal as well. This depends on the installer used, but we strongly suggest scanning your PC as soon as you find Browser Guardian App to make sure that this ad-supported program is the only unreliable program you need to delete from your Windows operating system. According to our researchers, Browser Guardian App is installed into browsers, including Internet Explorer, Firefox, and the older versions of Google Chrome. The components of this browser extension ensure communication with remote adware servers so that ads could be injected into the sites you visit. These ads could promote discounts, products, services, and installers. You have to take these ads with a grain of salt because the offers promoted via them could be misleading to lure you in. In the worst case scenario, Browser Guardian App ads could be malicious, and this is something to consider when discussing the removal of this advertisement-supported program. Do you think that the removal of Browser Guardian App is complicated? Luckily, it is not, and the guide below explains the process one step at a time. Of course, you must not forget that you might have to uninstall unwanted programs, remove data-tracking components, and possibly even remove malware. The best thing you can do in this situation is install a malware scanner. Based on the scanner report, you will be able to decide whether you should stick to manual removal or install automated malware removal software. Of course, we support the latter version if you do not want to face unreliable programs in the future. Simultaneously tap Alt+T to access the Tools menu. Click the recycle bin related to Browser Guardian App. Quick & tested solution for Browser Guardian App removal.